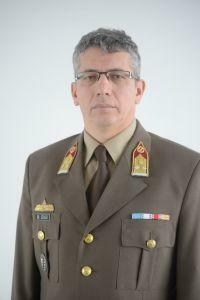 Colonel Pohl serves as Dean at the Faculty of Military Sciences and Officer Training. He graduated from Zrínyi Miklós Military Academy College and successfully completed the General Staff Course in Vienna in 1997. In 2008, he obtained the title Doctor of Philosophy. His research field is logistical support of military operations. He has been involved in academic matters for more than 30 years: he assumed several positions at the university i.e. : Professor, Head of Department, and Head of Institute, among others. In addition to his academic roles, he fulfilled duties with the Hungarian Army at different levels, including mission in Afghanistan. Dean Pohl is also a proud holder of numerous service awards. Col. Dr. Gábor Boldizsár served as Dean of the faculty until July 2016. Office: H-1101 Hungária krt. Zrínyi Campus, Building "A"
Colonel Szászi is entrusted with education related matters at the Faculty as Vice‑Dean. He graduated from the Miklós Zrínyi National Defence University, the predecessor of NUPS. He successfully completed the Doctoral School of Military Engineering in 2013. Subsequent to his admission, he has been pursuing academic path. 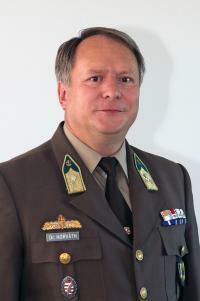 Alongside his military qualification, Vice‑Dean Szászi earned a degree in logistics management as well. Throughout the course of his three decades of professional career, he had been working many years at the University as professor. Afterwards, he was assigned to various leadership roles also within the University. 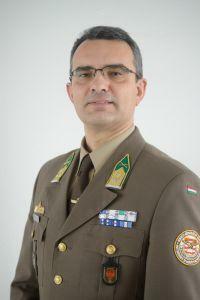 Colonel Jobbágy is responsible for the scientific life and international relations at the Faculty as Vice‑Dean. His academic career has started after he graduated from reputable European research universities, such as University of Hamburg in Germany and Leiden University in the Netherlands. Vice‑Dean Jobbágy has been continuously enlarging his knowledge on military sciences by participating to international certified training programs, which he later leveraged in the education, as well as in his researches. Prof. Dr. Col. László Kovács served as Vice-Dean for Sience and International Affairs until July 2016. Prof. Dr. Lt. Col. Zoltán Krajnc served as Vice-Dean for Science and International Affairs from July until January 2017. Colonel Judit Mészáros is responsible for the coordination of the administrative work at the Dean’s Office. Col. Mészáros graduated from the Loránd Eötvös University, Budapest, Faculty of Humanities. She started her carreer as a teacher in the military higher education. In 2001 she joined the administration at the Ministry of Defence. After working nine years in various departments of the Ministry, she continued her carreer at the Miklós Zrínyi National University of Defence (Office of General Secretariat), and in 2013 at the National University of Public Service, Faculty of Military Science and Officer Training (Dean’s Office). From 2003 she served as a contract officer, while from 2007 she continued as a carreer officer. In 2018 she successfully applied for the position of Head of Dean’s Office and was promoted to colonel. Her special research fields are gender mainstreaming and equal opportunity issues. She followed Col. Miklós Vörös in this position, who served as Head of Dean’s Office until February 2018. Office: H-1101 Hungária krt. Zrínyi Campus, Building "8", floor 1.